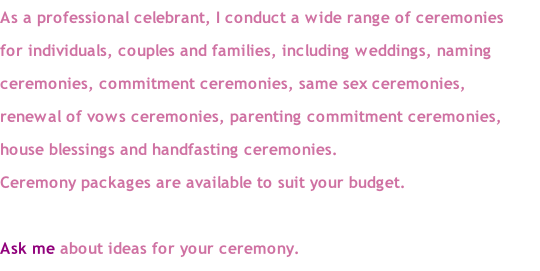 I provide you with a ceremony planning book full of ideas, seek your input on what you want in your ceremony, attend to the legals and include a rehearsal with most packages. these ceremonies can be held for babies or children or anyone who is celebrating a change of name too. Often they replace a christening or baptism for non-religious families. So where did the tradition of groomsmen come from? Historically, in different cultures, the groom kidnapped his bride and the groom’s friends assisted him. This is where modern day groomsmen came from. At the altar, the groom stood on the bride’s right side so that his sword hand (right hand) was free to repel any last minute efforts by her family to rescue her. I believe there is no right or wrong way to have a ceremony – each of my ceremonies is structured around the couple, family, or individual, the venue, their guests, the season, their theme and their wishes. 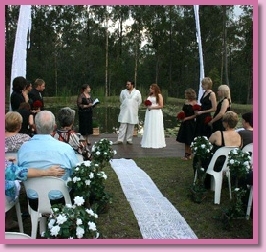 I provide ideas and support so that they can have a ceremony that is all about who they are and what they want. Each ceremony I write is unique to the couple or family. With every wedding, naming, renewal of vows, commitment ceremony…I have new experiences to build upon and add inspiration for developing new ideas and rituals. Together we develop a synergy and harmony which comes out on the day as a ceremony spoken from the heart, a wonderful trust between us and a happy and smiling couple or family at the end. I have a deep sense of the responsibility entrusted to me by each family or couple for this once in a lifetime moment. Even if this is a second ceremony for one or both, it is still a unique moment in their life together, a once in a lifetime event. I particularly love alternative ceremonies like handfasting, invoking the angels, circle ceremonies…for those who are spiritual but not religious.